In most music today, there is more rhythmically going on than meets the eye. Buried deep beneath the pulsing kick drums and gun shot drum rolls, synths are serving a bigger role than just the chorded foundations of our music. If you peel back the layers of a track and really listen, you can hear pads with slight movement in most pop music tracks. This is borrowed heavily from EDM and other styles that rely on more than just the drums for motion in a song. This has actually been a very sparse segment of the plugin community with either powerful versions that are too complex to place on a track and set and forget (iZotope Stutter) or very limited in its use (Avid Filter gate). That pretty much sums up the state of affairs for motion based gate plugins that are big players on the market. Of course, there are virtual instruments that offer gating and arpeggiators but sometimes you need a plugin to do the work after the fact. French company XILS Lab has you covered. This small operation founded by Xavier Oudin has mainly dealt in the area of software synths as well as very accurate recreations of classic analog synths, but has seen a need for a standalone plugin to tackle rhythm-based effects. 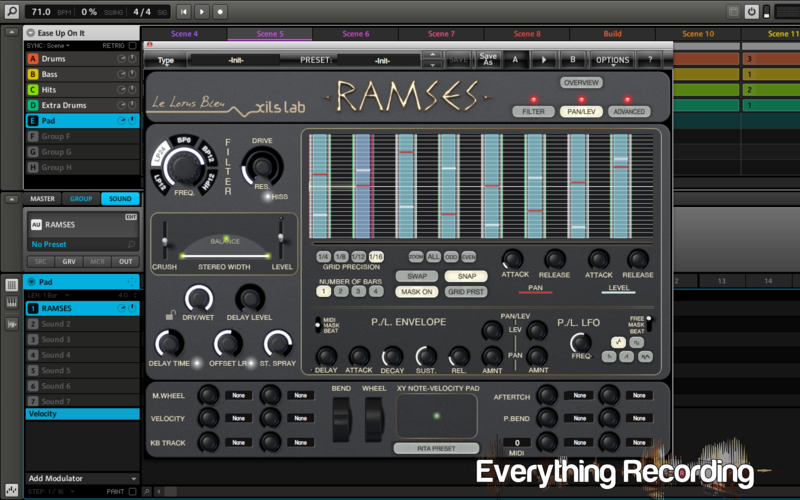 XILS Lab has created RAMSES just for this. The plugin comes in all shapes and sizes including AAX-64, RTAS, AU, and VST and offers more than just a basic gate. Users can program panning, filter, volume level, as well as just about any of the other effects this one-of-a-kind plugin offers. Motion doesn’t just include changing the volume at patterned intervals and Xavier understands this. Alongside your obvious choices of level, pan, and filter lies stereo width effects, special delays, saturation, and all out audio degrading mayhem with the “crush” control. Each of these can be added at rhythm-based intervals or globally across the track. This plugin contains a lot of diversity, but also leaves you wanting in some areas (more on that later). Installation and authorization is as simple as they come with a one time prompt asking you for the serial number once, then never asking again, even on updates. Just how it should be. Upon opening the plugin you will see an interesting interface with a great deal of controls and windows. Understandably, when you’re working with this many different effects and tools for shaping, you are going to have a crowded interface, but for the most part, the controls are fairly divided up nicely. It just takes some patience and time to learn the tricks. Unfortunately, the manual needs some sprucing up and contains some very confusing language (especially in deciding what color the level 1 and 2 bars are in the mask display. This comes in part from a slight language barrier, but it still should’ve been run by a translation service or a fellow developer with a firmer grasp on English. There were also some missing parts explaining how to properly use the “Advanced” section of the plugin, leaving you to fiddle with knobs and presets until you get a little understanding. In operation, I found RAMSES to have quite a bit of features. The filter section worked fairly well and on its own, can add a nice analog warmth to an over digital synth using the drive control. I did have a problem with making the drive level knob perform and immediately wished that the controls were different on quite a bit of the functions. In order to turn this one knob up, one has to drag down instead of up like the rest of the buttons. I also found that some features were not in plain site or even really labeled. There are several small LED looking controls next to the delay options that control timing and delay offsets that need better labeling. The actual heart of the plugin lies in the multimode panel, which is the big open window on the right side of the interface. This is where your filters, volume, pan, and just about any control can be automated to a rhythmic pattern. Users can select between snapping the increments to the tempo or free flowing to add a more human element. By clicking the “overview” button at the top, one can see all of the filters in one window, which is perfect for a big picture of what controls you have working at any given time. I feel that the grid window needed a little work but is manageable once you become accustomed to how it works. Users can pretty much control any given aspect of RAMSES using the advanced panel, but if that’s not enough, you can use RAMSES’ own RITA control for live performance of each of the controls. Midi Learn is also available. Overall I found that the plugin does exactly what it is supposed to do, provide movement to tracks. I even found that some of the effects work great, even when movement is not required. The filter section and drive section can add a little saturation to all sorts of tracks, and even the crush could instantly add more high frequency content to tracks. I just wish the crush control had a little more headroom between slight crushing and all out signal loss. The delay was actually very surprising to me and I use it constantly of leads and pads. It’s not too outspoken and adds quite the character to all sorts of content. One disappointment I had was the “stereo spread” control. You pretty much have to keep it above 75% for the track to sound presentable and not out of phase, and even when you pan the signal to either side of the stereo field, it is still present in the other side. I would like to see this area improved to work more like Waves Doubler plugin. One thing I will say about this plugin is that it fills a void in audio; and even though it doesn’t do everything I wanted out of a rhythm based plugin, it gets the job done. Some of the areas that left me wanting is the layout of the multimode panel where the levels are controlled. Something needs to be scaled down to allow for quicker control. I also wanted to see the ability to make pattern edits faster than just 1/16ths. Sometimes you need to be able to edit that fast choppy sweeping across the spectrum but with RAMSES, you’re limited to 16ths. I’m not actually sure how this panel could be put together to make life easier but I feel more visual representation and control of the volume levels would be a start. I will say that the founder Xavier is very open to suggestions and fixed quite a few bugs I encountered while testing RAMSES out. All-in-all, I say bravo to XILS Lab team for filling a void that I’d been having for a very long time and I look forward to future improvements to RAMSES.